Designer clothes. Parties with champagne corks popping. Limousines. Dreamy guys falling at your feet. Oh, the glamour of New York! Isn't that what being a teenager in New York City is all about? After watching teenagers compare their NYC lives to those of the stars of hit TV shows, Meredith Zeitlin decided to write a YA novel capturing what it's really like to live in NYC as a teenager. Sweaty gym classes. Descending into the bowels of the city—also known as the subway. Having people hate you "just because." Living with annoying younger siblings. Freshman Year and Other Unnatural Disasters explores stepping off the precipice from "just school" into "high school." Kelsey decides she's going to abandon her personality from middle school and become a new and improved version of herself. Better love life. Better sports career. Better social life. Better after school activities. But something happens along the way to "new and improved"...and Kelsey has to live with the sometimes hilarious results. FRESHMAN YEAR AND OTHER UNNATURAL DISASTERS by Meredith Zeitlin from Anne Walls on Vimeo. Freshman Year and Other Unnatural Disasters is available at Amazon, Barnes & Noble, and your local bookstore. Book Giveaway Contest: If you would like to win a copy of Freshman Year and Other Unnatural Disasters, please leave a comment at the end of this post to be entered in the random drawing. The giveaway contest closes this Thursday, Feb. 23 at 11:59 PM PST. For an entra entry, link to this post on Twitter with the hashtag #FrYrDisasters, then come back and leave us a link to your tweet. We will announce the winner in the comments section of this post on the following day Friday, Feb. 24. Good luck! 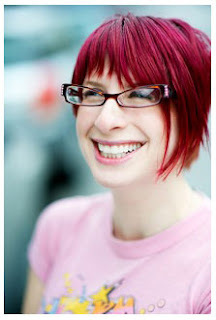 Meredith Zeitlin is a writer and voiceover artist who lives in Brooklyn with her two adorable feline roommates. She also writes a column for Ladygunn Magazine, changes her hair color every few months (we're taking bets on what color it is to celebrate launch day! ), and has many fancy pairs of spectacles. In case you're wondering whether any of Kelsey's experiences are based on Meredith's own, the answer is NO WAY. When she was fourteen, Meredith looked and behaved perfectly at all times—just ask her mother!—was never in a single embarrassing situation, and always rode to school on her very own unicorn. WOW: Welcome to The Muffin, Meredith! Your day job is as a voice over actor. So many writers also have day jobs. What do you feel you've learned in your job as a voice over actor that has helped you with your writing? Meredith: Well, for one thing I see a lot of terrible scripts—terrible mostly because they feature the same overplayed jokes done again and again. So that's a good reminder to try and stay creative. But mostly I learn from the people I see on my travels in NYC. I see so many different people (and different kinds of people) that it's like a constant opportunity to create characters or latch onto interesting speech patterns (dialogue and distinctive voices are super important to me). On top of that, actors looooove to chat, and voice over artists are no exception. So I hear all kinds of stories, and can also bounce ideas off of people whose lives and perspectives are totally different than mine. For instance, I can make up plenty of stuff about, say, a 50-something father of a teenaged kid (or whatever), but it's a whole different ballpark to consult one in real life in the comfort of a studio waiting room! WOW: That sounds like so much fun! What a great source of inspiration. When did you begin writing and what made you decide to write a YA novel? Meredith: I've never NOT been a writer. I come from a family of writers, and always loved making up stories as a little kid. I was the EIC [Editor-in-Chief] of my high school newspaper. I was in a 12-person screenwriting program in college. It was just...something I always did. Since graduating, I've written essays, articles and reviews for a variety of publications and websites, and started a few bigger projects that never really went anywhere because my attention drifted away. (There's my old friend procrastination again!) I started writing Freshman Year... because I was inspired by the girl I used to babysit for, but I think that my personality suits the genre, really. (I'm an adult who spends a great deal of time in PJ pants, watching cartoons and eating candy, after all.) I love books in general, but there's something about literature that's both nostalgic for adults and relatable for kids that's really appealing to me. WOW: As a YA writer, I'm going to guess you read a lot of YA also. Are there any common mistakes you feel some YA writers make? Meredith: I think "dumbing down" is the biggest problem I've seen in books for kids—of any age. Good, clean, thoughtful writing is just as important as a great idea, in my opinion. Maybe that's because I'm the daughter of an English teacher, but it makes me nuts when I read books that just...aren't well-written. WOW: Having a mom for an English teacher is probably the best incentive to write a well-written book! Wouldn't want Mom reading anything that's less than excellent, especially when she's in the position to compare you to every other writer in the world! Before you showed your book to Mom, did you have any young readers read your manuscript to check for an accurate portrayal of the teen life? Any eavesdropping as research? Meredith: I DID have some actual teens read drafts along the way! In particular, I asked a friend's (gay) daughter to help me craft JoJo's "coming out" storyline. I wanted to make sure it really rang true to other LGBTQ kids who might read the book. I do occasionally eavesdrop on groups of kids on the subway, and spend a ton of time at the school the girl I used to sit for attended. Honestly, though, I try to write PEOPLE, not kids. I think I talk the same way now as I did when I was 14, and I'm 1000 years old. Ditto my friends. Don't you? The differences are really the subjects and circumstances. That's crucial to remember to make dialogue engaging, I think. WOW: Can you tell us a few of your favorite YA writers? Meredith: My childhood favorites were—and still are—the classics: Judy Blume, Lois Lowry, and Paula Danzinger. I love Cassandra Clare, who I think is super creative and a terrific writer. I also ADORE the Georgia Nicholson series by Louise Rennison. The thing about visiting all these different YA blogs to publicize my book is that I'm discovering all these other books I never heard of before. Now that I'm really a member of the club, so to speak, I'm going to have to get to know my contemporaries' work better—I have a big list for my Nook already. WOW: If you could give fellow YA writers one piece of advice, what would it be? Meredith: Don't write down to kids just because they're younger that you are. Try to remember how you felt at that age when people talked down to you. Challenge kids to learn new words, to think, to push themselves. Don't write in a "teen's voice"—write in your character's voice. WOW: I love that! What can we expect from you next? Meredith: Well, I wrote a children's book that my marvelous agent is pitching right now. I also wrote a horror screenplay--something totally different!—with a friend of mine that I'd love to see get picked up. And I have a second YA book brewing—it's not a sequel to Freshman Year... but it takes place in the same world, so you'll see some of the characters again. WOW: You have been a busy girl! I wonder what would happen if you weren't procrastinating! We can't wait to see what comes next for you. Voice-over actor and author Meredith Zeitlin shares "How the Drama World Helps You Succeed in the Real World." You can also enter to win her YA novel Freshman Year and Other Unnatural Disasters. Meredith Zeitlin, author of the debut YA novel Freshman Year and Other Unnatural Disasters, posts about weaving a message into your writing. Cindy Hudson, author of Book by Book: The Complete Guide to Creating Mother-Daughter Book Clubs, interviews the latest author she wants to include on her mother-daughter book club selection list: Meredith Zeitlin, author of Freshman Year and Other Unnatural Disasters. Monday, February 27 @ Read These Books and Use Them! Don't miss your chance to win a copy of the YA novel Freshman Year and Other Unnatural Disasters and a post from author Meredith Zeitlin about how parents and teachers can use her book to communicate with their teens. Stop by today for a double treat! Jerri Ann Reason interviews Meredith Zeitlin in an AUDIO interview podcast, and there's a book giveaway! Need your YA writing to be convincing? Learn how to channel your inner teen from YA author Meredith Zeitlin. Return tomorrow for more about Meredith's writing. 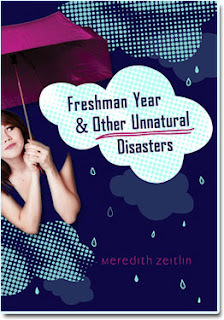 Buried in Books has dug out of her TBR pile long enough to post a review of Meredith Zeitlin's Freshman Year and Other Unnatural Disasters. Meredith Zeitlin tells all her deep, dark secrets during an interview at I Am a Reader, Not a Writer. She's also giving away a copy of her debut YA novel Freshman Year and Other Unnatural Disasters. Writing is a full time job...but what if you have another job? Author Meredith Zeitlin writes about managing two full time jobs. Don't miss a review of her debut YA novel tomorrow. Don't miss today's review of Freshman Year and Other Unnatural Disasters, a debut YA novel by Meredith Zeitlin. Meredith Zeitlin, author of the debut YA novel Freshman Year and Other Unnatural Disasters, stops by with some tips for shaping the lives of your teen readers. Debut YA novelist Meredith Zeitlin is playing tour guide today as she shares "Five Overlooked Treasures Everyone Should Experience in Brooklyn." Put them on your list for your next trip to NYC. When was the last time you wanted to be invisible? YA author Meredith Zeitlin gives us some advice in "Standing Tall...Even When You Want to Hide." This is also your LAST chance to win a copy of Freshman Year and Other Unnatural Disasters. Wonder what makes authors tick? Find out today during an interview with Meredith Zeitlin, debut author of the YA novel Freshman Year and Other Unnatural Disasters. Stop by for a review and 5Ws on YA author Meredith Zeitlin. Don't miss the final date on Meredith Zeitlin's WOW Blog Tour. Her YA novel Freshman Year and Other Unnatural Disasters will be reviewed by a teenage reviewer! To view all our touring authors, check out our Events Calendar here. If you have a blog or website and would like to host one of our touring authors or schedule a tour of your own, please email Robyn or Jodi at blogtour@wow-womenonwriting.com. 1. For your first entry, just leave a comment on this post. Leave a comment or ask Meredith a question to be entered in a random drawing. 2. For an extra entry, link to this post on Twitter with the hashtag #FrYrDisasters then come back and leave us a link to your tweet. The giveaway closes this Thursday, Feb. 24 at 11:59 PM PST. We will announce the winner in the comments section of this post the following day—Friday, Feb. 25, and if we have the winner's email address from the comments section, we will also notify the winner via email. My daughter is entering high school in the fall, and it sounds like this book would be the perfect summer read for her. I might have to steal a peek myself, though! Could help me remember what it's like to be 14. Looking forward to the book! I'm so excited to be a part of THIS BLOG TOUR. I've already got my copy of the book, so don't enter me, but I just wanted to say that I think honest books for the teen audience are SO IMPORTANT. And I completely agree with you about NOT dumbing down the book. I also have a teen in my novel critique group--she is a genius at fantasy writing (makes me sick!) but the best thing is how she helps me with my YA. Every session, she'll have a comment like, "Um, people in high school don't really do this anymore." As adults, we think we are so in touch, but unless you are in the trenches day in and day out, it's not the same. :) Anyway, I digress. Have a fantastic blog tour! "See" you Monday! If this book is half as funny as her twitter posts her readers are going to love it. Would love to win a copy of this book! I would like to write a YA book and have one in progress right now. I really like the comments about NOT "dumbing down" the writing style. That is so important. I teach HS English and there is nothing kids hate more than when you speak in a condescending tone to them. They know I'm flustered with them NOT when I talk to them like children, but when I lower my voice and start using words they have to really pay attention to to understand. They make me laugh when they say, "She's mad. She's using big words." But, then they ask what they mean so I guess it's a "teachable moment". Great to be considered for a free book! Sounds so cute, and sounds like a smart author behind it! Meredith is awesome and I'm featuring her on my blog Feb 28t! This sounds like a terrific book! I'd love to read it, and maybe pass it on to my daughter...though she's only 11, she reads above her age but this mama is not mentally ready for high school! I know exactly who to give this to. My nephew will soon be entering highschool and he loves to read. I really think he would enjoy this. Would love a copy of this book for my middle school language arts classroom library! Tweeting to win as well! I'd love to win a copy of this book! I'm always happy to read a really smart YA novel, and Meredith seems like she tried incredibly hard to write a genuine story. i would love to win! :) looks like a fun read. I adore the title of this boo! Thank you for commenting on Meredith's book launch. We held a random drawing via random.org and the winner is... Joisey Dani! Congratulations! You won a copy of Freshman Year & Other Unnatural Disasters by Meredith Zeitlin. Please send us your mailing address to blogtour@wow-womenonwriting.com and we will forward it to Meredith for you. I saw you have an email addy in your profile so we will follow up with an email as well.